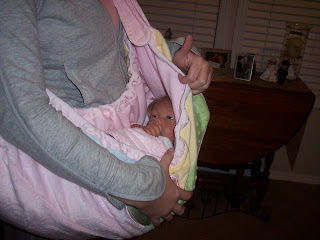 Here is a fun quiz posted by Amy on My Heart's Refuge at http://www.osbornz.net/amy/ . If you do this quiz, post it on your blog and leave me a comment so I can come look! 1. What do you normally wear to bed? 2. What was the last trip you took? 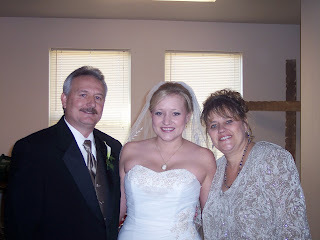 I just wanted to be a pastor's wife and a mom! 4. When was the last time you went dancing? 5. What kind of shoes are you wearing right now? 7. What is one thing you crave almost everyday? There are two things I LOVE to do that are so fulfilling to me. 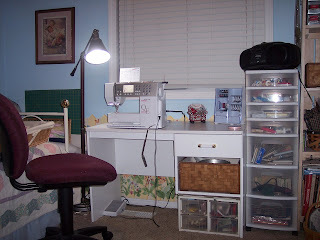 One is to cook for my family and the other is to sew. They are both creative outlets that make me feel like I am doing a good job being a wife and mother. I even feel sometimes that I can know just a little bit how God must have felt after he finished his "burst of creativity" when he created the world and sat back and said "It is good!". I kneed the dough and then roll it out flat. After it is rolled out I then use my secret ingredient: nutmeg! 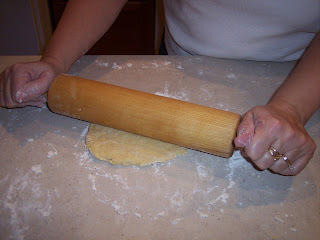 Sprinkle the nutmeg lightly over the surface of the dough and roll over it a time or two with the roller to press it in. Then I cut the noodles into 1/2 inch strips and throw them in the cooking broth. I also add about 2 tbsps. 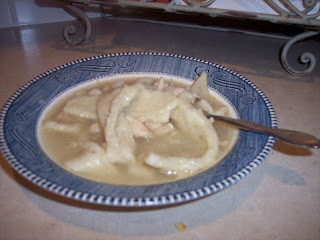 of chicken bouillion to the broth. Then I debone the chicken and add the meat to the broth and let it all simmer for about 30 minutes. It is absolutely delicious and the left overs are even better! I am so happy with how it turned out! 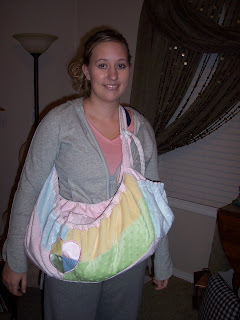 Someday I will have little grandbabies to make these for! I have a whole pile of patterns and fabric that I can't wait to get started on! Now that the wedding is over I can start doing some of these projects. I plan to make some baby quilts for gifts for new babies arriving in our church, some really neat "stack and whack" quilted placemats, and a special wallhanging that I received as a gift for Christmas. I can tell my creative cravings are about to be fulfilled and "IT IS GOOD"! This last weekend I had the privilege of seeing my daughter in a leadership position and I am just beaming with pride for her! She is the vice president of her junior class in a small Christian school. They are trying to earn money for their senior trip next year. She and her friend who is the class president decided to host a silly supper. They ended up doing ALL the work themselves. They planned the menu, printed and sold tickets, collected money, bought all the food, set up and decorated the tables and trained the waiters. They also recruited my husband and I to do the cooking! They sold 96 tickets and made about $700 for their class. I sat back and watched as she spoke in front of the crowd and organized the waiters, patiently explaining their jobs to them. When things didn't go smoothly, she stayed flexible and worked through the problems. I am just so proud of her. The evening was a total success and she received many compliments for the event. I have always heard that pk's have natural leadership abilities because of all the ways they have had to learn how to make do living in a parsonage. I guess this is true! I know that this is another occasion of life in the ministry being a life of privilege! 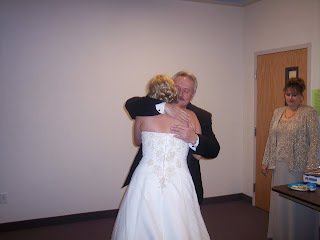 I am recovering from a whirlwind week and weekend in which my oldest daughter got married. It was such a beautiful, magical day and we had so many fun events that surrounded it. Everything seems kind of lonely now - a let down of sorts. But it is also a good feeling to try to get back to "normal"! 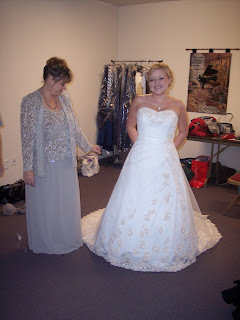 Here is a picture of the lovely bride as I am admiring her. She was absolutely radiant! This is when her dad saw her for the first time, which made all of us cry sweet tears! Wednesday: My whole family took a dance lesson! 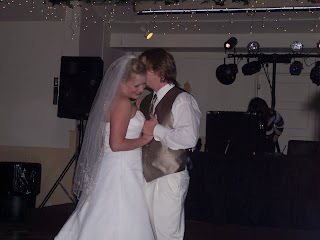 Michelle and Brad had a wedding dance but none of us have ever danced before! We learned a few basic steps that got us through! Thursday: A bachelorette party at P.F. Changs. It was very yummy and may I say that my new favorite food is Kung Pow Shrimp! Wowsers - it was good! Friday: Decorating at the church all day and rehearsal at 6:00 with a dinner following. Sunday: My family all met for breakfast and then we went to church. Monday: Airport runs all day long! God is so good!! This weekend I had an answer to prayer that just confirmed in my spirit how much God really cares about the small and the large things in our lives. Let me explain: Around the first of December I was worried because I simply don't have enough furniture in my home for everyone to sit on when my family is all there. I hate bringing in folding chairs or having people sit on the floor. With the wedding, I knew there was no way to buy furniture. So I thought about just praying for it. At first, it seemed so trite, so unimportant that I felt foolish praying about it. But I prayed anyway. On Saturday a man from our church offered my husband a sectional sofa that has 2 recliners to our teen room in the church! My husband didn't even realize that I had been praying for furniture, but knowing we NEEDED furniture asked the man if we could use it instead and of course, he was delighted. GOD GAVE ME THE FURNITURE I HAD PRAYED FOR! Now this just warmed my heart because I have been also praying for a long time for the salvation of a very dear loved one and nothing seems to happen. But when God answered the furniture prayer I realized that if God cares so much about the little things in my life, how much more must He care for things like salvation for those that we love. It was like He just whispered to me: "Be patient, I am working". So my heart is cheered, we have furniture for all to sit on (and I am having lots of company this weekend for the wedding), and I know that God is working for the salvation of my dear loved one. 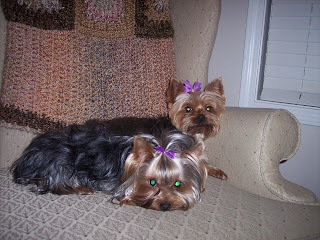 We are in full wedding mode at our house this week - even the yorkies had a day at the spa and are looking pretty for the big event! This is Josey. 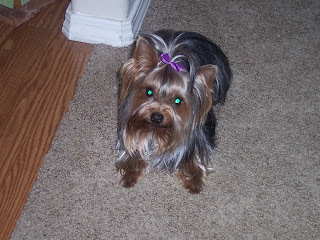 I left her in a longer coat because her hair is very silky and much easier for me to keep groomed. 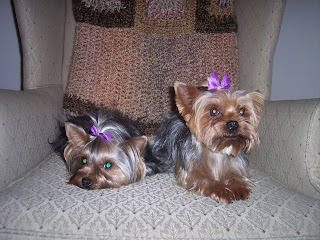 I had Pebbles cut in a shorter coat. This is the first time she has not been in full coat. Of course they will not BE at the wedding. But we are having alot of company so I wanted them to look good. Normally I do all their grooming but this occasion calls for a professional job! Okay, first I should tell you that I am the most UNsports loving person in the whole world. I never have liked sports. I don't like the importance placed on sports, I don't like what athletes get paid, I don't like the idolotry that sports figures incur. I especially hate when sports events get put before church events. With all that being said, I will confess that I watched my very first complete entire football game on New Year's Day. And it was so FUN! Boise State University went to its first ever BCS bowl in Phoenix, Arizona. The Fiesta Bowl. It was all you ever heard about around here for weeks. It was on tv, the news, papers, friends, grocery stores, you name it - I promise you - that's all anyone talked about. Some people from our church went - along with 30,000 other people from our state! So I figured the least I could do was watch it on tv. Boise State took alot of criticism - some thought they shouldn't be in the bowl, even though they had a perfect 12-o season. Some thought that we were too small of a school and could not compete with bigger schools. Well, if you watched the game - you saw what happened. We beat Okalahoma University in overtime by 1 point. Many commentators said it was the best college game they had EVER seen. Even though I didn't understand much of the game - I understood the emotion and the excitement. So....I don't think I will ever be a football fan - but it sure has been fun being a part of the excitement the past few weeks here in Idaho.